Team members at the Toyota Manufacturing West Virginia plant in Buffalo put the finishing touches on a group of 4-cylinder engines. CHARLESTON, W.Va. — As President Donald Trump continues to consider closing the United States’ border with Mexico, West Virginia business owners and industry advocates worry about the effect it could have on the state’s automotive sector. Trump tweeted in late March he was considering a closure. On Friday, The New York Times reported that Trump had urged Kevin McAleenan, his choice as acting secretary of homeland security, to close the country’s southwestern border. Mexico is West Virginia’s 11th-largest trading partner based on dollar value, according to 2018 Census data. 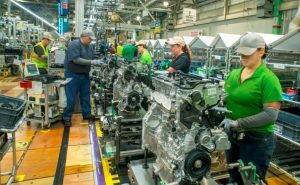 Trade with Mexico supports 23,000 jobs, according a 2017 report from the Wilson Center, a nonpartisan research institute. West Virginia’s exports to Mexico have increased by 378 percent since 1993, according to the report.